In a “past life”, I spent lots of time driving. And do you want to know the worst thing about long journeys? It is how boring they can be. And do you want to know what my solution was? and lots of junk food! And that meant I needed a mug to keep my coffee hot in. There are lots of coffee addicts out there who, like me, like to have coffee when they are out and about. And that means that they need to find the best thermos for keeping coffee hot. Before we start looking at these thermos mugs individually, let’s talk about the type of qualities that people want in a thermos mug or flask. This quality is so important that it is almost too obvious to write about. In order to be enjoyed at its best, coffee needs to kept hot and in order to be refreshing cold drinks need to be kept cool. And day in day out for years. Because drinking a stone cold coffee and a luke warm energy drink just doesn’t cut it. Thermos mugs are needed by people who are on the go, moving from place to place. The best ones need to fit in our car cup holders. They need to be 100% non spill and non leaking because sometimes they are going to be shoved in a bag upside down. And they need to be able to take the odd knock or two because such things happen when we are in a rush. Many people need a insulated cup as part of their work day. And most people still need to dress smartly for work and ours mugs need to be as stylish as we are. They have to help us look the part and feel the part. Even outside of work, a thermos mug has to complement or add to our smart image as we are working out in the gym or even going for a hike. Any thermos needs to be easy to use and to clean. We need a mug that is comfortable to hold and can be used with one hand. After all, what is the point of being cup holder friendly if I need two hands to operate the lid? Or of being comfortable to hold if I can’t sip from it and chat with friends on the phone? Just give a button to press or a lever to flick because unscrewing a cap is a big “no no”. And it had better to be easy to clean. Because when we are finished with our thermos, we are finished. The work day has ended, the gym session is over or the latest adventure completed. Anything too difficult won’t get done and if the flask or bottle is too much of a challenge to clean, it won’t be used again! Now that we have looked at some of the important features of a perfect thermos, let’s look at each of my top five cups, one by one. Apart from looking sleek and beautiful, this thermos flask is available in four vibrant colors. Most importantly, using its thermalock vacuum insulation, it will keep your drinks piping hot or ice cold for hours. The autoseal feature means that as soon as you stop drinking from this mug, the lid will close securely and not leak or spill any contents which will give you peace of mind and save you time. This flask promises to be a perfect companion to anyone with a busy lifestyle. It is ideal for drivers and will fit easily into most car cup holders. It can be operated with only one hand which is perfect for train and plane passengers. Finally , it is easy to clean and its lid can be put in a dishwasher. And because it is BPA free, it is totally safe to use. The unique feature that this mug has in my comparison, is the autoseal feature. After you have finished drinking, without doing anything, the flask locks itself shut. It is for those people who need a coffee cup that looks smart enough to match their own sense of style. With its guaranteed anti spill function, this cup promises not too ruin that look either! Another real strength of this mug is that it can truly be used with one hand meaning that those who like to drink their coffee with driving, running or chatting on their phone can be safe in the knowledge that this cup will really work for them. This is a very lightweight and robust flask that comes in a range of 12 different colors, including coral pink and matte gold. Using a two step slow release lid system helps to avoid any unhelpful splattering of liquids. Keeping your drinks hot for up to 8 hours, this flask is easy to clean with a detachable lid a non stick interior coating. The outstanding feature of this flask is that it comes with a huge 5 year warranty. If over time your flask doesn’t keep your drinks as hot or as cold as it should, you will get a replacement. This warranty makes it a perfect buy for someone who wants to know that the flask or mug that they are buying will last for a few years. This flask, like some others has a very wide range of color options. But, some of the Zojirushi colors are much more unique, such as Matte Gold- which will appeal to people looking for something a little different. With a stated aim of saving the world from “lukewarm”, hydro flasks promise to deliver a performance that is as brilliant and vibrant as their colors. And have you seen their colors? Wow..
Tempshield is a double wall, vacuum insulated design that means that your drinks will stay hot for 6 hours and cold for 24 hours. This flask has no taste transfer, which means that today’s coffee won’t taste of yesterday’s sports drink. And Hydroflask want to you to reduce waste by using this flask in your local coffee shop, instead of using a disposable cup. I think that there a few unique features that make Hydroflask really appealing to buyers who are concerned about the environment and the world around them. Firstly these flasks come with a lifetime warranty- which is amazing. Whilst most other flasks are BPA free, Hydroflasks are BPA, Phthalate, and Toxin-Free. And Hydroflask donate 5% of the cost of your flask to the charity of your choice. There is no other insulated drink company that comes close to the iconic stature of Thermos! This flask is beautiful to look at, easy to use and will last for many years. The King is available in a range of nine very stylish and classic colours. Promising to keep drinks hot for up to 5 hours, this flask can be used by for both tea and coffee- as there is a tea hook included. The lid has a built in lever on the lid that can be flicked right or left to open the valve when you want to drink. Its vacuum insulation means that the flask is easy to hold regardless of whether it is filled with a hot or cold drink. And a solid five year warranty means that this flask could be part of your adventures for many years to come. 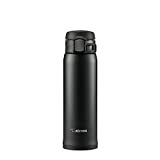 Thermos Stainless King is for people who associate quality and class with established brands. If you want peace of mind knowing that your device has been made by the experts, buy this flask. The Bubba Classic Desk Mug is an insulated drinks mug that can hold very large quantities of your favourite hot and cold drinks. 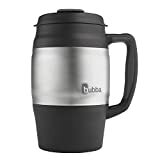 Some users report that it can keep drinks hot for 6 hours and cold for 12 hours, the Bubba is great in situations where you are going to be “stuck” in one place for a very long time. Created in the classic keg shape, this mug is incredible stable and can’t easily be toppled over. This mug has two unique features in my comparison- its size and the fact that it has a handle. Shaped like a barrel, this mug has been designed for people who drink huge amounts of hot or cold liquids. And if you like a handle on your mug, then the Bubba has your name on it! This mug is perfect for people who spend their days working at desks- either working from home or in an office.